Here are two more items on the endless disputes over sugar intake. Most US adults consume more added sugar than is recommended for a healthy diet. We observed a significant relationship between added sugar consumption and increased risk for CVD mortality. The relationship between added sugar intake and CVD mortality remains unresolved. The study by Yang et al1 does not support implementation of health policies limiting sugar intake because a relatively small fraction of the total population ingests excessive amounts of sugar by the IOM criteria….Laws attempting to limit excess sugar intake have been passed and overturned on legal grounds. Aside from the legal questions, there is insufficient scientific evidence to support pursuit of policies limiting sugar intake. The Institute of Medicine (IOM) recommendation is that less than 25% of total kilocalories come from added sugar. Oops. The IOM made no such recommendation. Instead, the IOM said 25% of calories was the upper limit of safe sugar intake for nutrient deficiencies. The risk of nutrient deficiencies increases above that percentage. That IOM report said nothing about the relationship of sugar quantity to risk of chronic diseases. Most health authorities recommend no more than 10% of calories from added sugars as a means to reduce the risk of obesity, diabetes, and heart disease. Most research shows that chronic disease risks increase with increasing sugar intake. 2. What is the FDA doing about “Added Sugars” on food labels? According to all sources, the FDA is still working on what to do about Added Sugars on the new Nutrition Facts panel. It is engaged in two studies of this question. It says the added sugars study is complete and the data are being analyzed. It says the format study is in the works. The FDA was criticized for proposing added sugars on the label without having done the research first. Apparently, the White House Office of Management and Budget took 9 months to approve the FDA’s proposal to do the sugar research. The approval came after the FDA issued its label proposal. The bottom line on sugar: Less is better. Roni Neff, editor. Introduction to the U.S. Food System: Public Health, Environment, and Equity. Johns Hopkins Center for a Livable Future, Jossey-Bass, 2015. 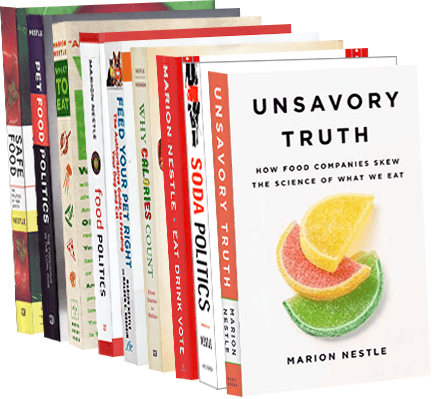 This is an undergraduate textbook for students in courses dealing with almost anything having to do with food as it relates to larger societal issues of economics, policy, marketing, culture, security, health, and the environment. It is large (542 pages, 8.5 x 11), easy to read, and well illustrated. It ought to be terrific in stimulating thinking about these issues, particularly because it covers everything you can think of that’s important in this area, from farm subsidies to school lunches. The only thing missing is international dimensions, but that would take another book of this size. Also focused on the U.S. food system is the Institute of Medicine’s report I wrote about a couple of weeks ago: A Framework for Assessing Effects of the Food System. Congress, in its infinite wisdom, is again using the appropriations process to micromanage nutrition standards for school meals and the WIC program, against the advice of the Institute of Medicine and other health experts. The new appropriations bill includes several provisions relevant to issues I discuss frequently here. By all reports, this is the best that can be expected, given the makeup of this Congress. Section 751 grants exemptions to states from the whole grain requirements for school meals “Provided, That school food authorities demonstrate hardship…in procuring specific whole grain products which are acceptable to the students and compliant with the whole grain-rich requirements (my translation: forget whole grains and recommendations by health experts. They are way too much trouble). Section 752 says that no federal funds may be used to pay the salaries of people doing work “that would require a reduction in the quantity of sodium contained in federally reimbursed meals, foods, and snacks sold in schools…until the latest scientific research establishes the reduction is beneficial for children (We know more about the effects of salt on health than do health professionals and expert committees). Section 753 says Congress won’t pay the salaries of anybody who tries to “exclude or restrict, he eligibility of any variety of fresh, whole, or cut vegetables (except for vegetables with added sugars, fats, or oils) from being provided under the Special Supplemental Nutrition Program for Women, Infants, and Children (no, you can’t keep white potatoes out of the WIC program). Chalk these up to effective lobbying by the School Nutrition Association, makers of salty snacks, and the potato lobby. Congress did not roll back most of the USDA’s food standards for school meals. It only cut SNAP by $400 million. It only cut WIC by $93 million. These must be considered enormous victories, given the circumstances. Since 1980, U.S. dietary guidelines have advised eating less sodium (salt is 40% sodium, 60% chloride). Although sodium is an essential nutrient, most Americans consume way more than they need or is good for them—around 3,400 milligrams a day. The 2010 guidelines advised healthy people to consume no more than 2,300 mg per day (~6 grams, or 1.5 teaspoons). They advised even less, 1,500 mg, for people with or at high risk for high blood pressure. Since blood pressure increases with age in countries with high salt intake, this applies or will apply to just about everyone. In 2011, the Institute of Medicine said it was imperative to find effective strategies to lower salt intake. This means dealing with processed and restaurant foods, because that’s where most of the salt comes from, as can be seen from this list of major food sources. Because consumers have no choice about the amount of salt in processed and restaurant foods, education cannot be enough to achieve salt reduction. Scientists in Australia have just proved this point. Why anyone would think that nutrition education alone would change behavior is beyond me. By this time everyone should know that to change behavior requires not only education, but a food environment—social, political, economic—that supports and promotes the behavior change. Most dietary sodium comes from processed foods, restaurant foods, and other pre-prepared foods. All the label can do is say ‘don’t eat me’ It can’t help with what people can eat. The easiest and most effective way to help people reduce sodium intake is to require food producers and food preparers to use less of it. Good luck with that. I’m not optimistic, particularly given the conflicting and confusing science. Ah yes. The conflicting science. The IOM now says that there’s no evidence one way or the other that reducing sodium below 2,300 mg per day, or even to 1,500 per day, does much good, and that low sodium intakes could be harmful (but this too is controversial). It may be true that there are no benefits in an ultra-low-salt diet, but almost no one is eating an ultra-low-salt diet. It’s not quite like worrying about whether we get “enough” sugar, but it’s nearly as ridiculous. As to whether we should cut back to 1,500 mg or to 2,300 mg sodium a day, meanwhile, the jury is out, says the IOM, not because consuming 1500 mg/day is dangerous, but because there is just not enough data on the benefits of consuming such low levels to support a firm conclusion. Rather than focusing on disagreements about specific targets that currently affect less than 10% of the US population (ie, sodium intake of <2300 mg/d vs <1500 mg/d), the IOM, AHA, WHO, and DGA are congruent in suggesting that excess sodium intake should be reduced, and this is likely to have significant public health effects. Accomplishing such a reduction will require efforts to decrease sodium in the food environment…. Salt intake — like weight, and body mass index — is a convenient baseline for public policy people to talk about. If you focus on eating less salt — and, indeed, less sugar — you will inevitably eat less processed food, fast food, junk food (it’s all the same thing.) If you eat less processed food (etc.) you eat more real food. If you eat more real food, not only are you healthier, but you probably don’t have to pay attention to how much salt you’re eating. Wowie zowie. Initiate a rule-making proceeding to ensure that the content of sucrose and HFCS in beverages is limited to safe levels consistent with authoritative recommendations. Set targets for lower levels of added sugars in other foods that provide significant amounts. Conduct a public education campaign to encourage consumers to consume less added sugars. Why? Check out CSPI’s infographic: Sugar: Too Much of a Sweet Thing. Develop means to reduce the use of added sugars. The undersigned scientists and organizations are concerned about Americans’ excess consumption of added sugars…Every edition of the Dietary Guidelines for Americans (going back to 1980) has recommended reducing consumption of added sugars, but Americans are consuming more added sugars (including sucrose, high-fructose corn syrup, corn syrup, and other caloric sweeteners) now than they did in 1980. And that high level of consumption…is contributing to serious health problems. If the situation with trans fats was any indication, the food industry will reduce the sugars in its products if it has to disclose them. This is not the first time that CSPI has tried to get added sugars labeled (see petition from 1999). I’m hoping the letter of support will encourage the FDA to take action this time. Maybe it will even put sugars on front-of-package labels, as the Institute of Medicine suggested in 2011. FDA’s research on food labels: any help? Nutrition Facts panels on food labels are notoriously confusing. People who use them usually look for only one item such as fat or calories. As I’ve discussed previously. the label is so difficult to interpret that the FDA devotes pages on its website to explaining it. When the FDA did the original research in the early 1990s, it tested a large number of formats. When it became clear that people did not understand any of them very well, the FDA chose the least worst—the one that was understood least poorly. Two decades later, the FDA is revisiting the Nutrition Facts panel to make it easier to understand in the light of today’s concerns about calories and obesity. Once again, it is testing multiple formats. The results of the first round of research have just been published in the Journal of the Academy of Nutrition and Dietetics (JAND), and reporters are trying to make sense of them. FDA researchers tested 10 formats differing in number of servings and columns (1 or 2, each), font size, and wording. They asked respondents for opinions about the healthfulness of the product, number of calories and nutrients per serving, perceptions of the label, and the ability to choose healthier products and those with fewer calories. This, like the research in the early 1990s, is complicated. For products that contain 2 servings but are customarily consumed at a single eating occasion, using a single-serving or dual-column labeling approach may help consumers make healthier food choices. Soda companies are already doing something like this, but a 20-ounce soda has more than 2 servings. Serving size is what confuses. If it’s 100 calories per serving, those calories have to be multiplied by the number of servings per container. The Institute of Medicine produced two reports for the FDA on front-of-package labels and also suggested a way to integrate its ideas into the Nutrition Facts label. Is the FDA testing this idea? I hope so. I cannot help but think of you and the work that you do having a great impact on the first signs of child/youth obesity declining. Although the “researchers” indicate they are not sure of the reasons for the decline, I think many within the food / food politics community know that the work you do, the awareness you spread and the advertising you expose, greatly affects the way we feed our children. As a real food advocate and parent, thank you for the work you do. Thanks but I can take no credit (much as I would love to). The writer is referring to a front-page, right-hand column story—the most important of the day—in the December 11 New York Times. The article said that several cities are reporting drops in childhood obesity rates. The drops may be small, just 3% to 5%, but any reversal in obesity trends is excellent news. Last September, the Robert Wood Johnson Foundation first reported such drops. It noted that the declines were occurring in places that had taken comprehensive action to address childhood obesity. New York City, for example, has engaged in major efforts to make healthy dietary choices the easy choices. Health Commissioner Tom Farley recently reported a 5.5% decline in childhood obesity. has undertaken a broad assault on childhood obesity for years. Sugary drinks like sweetened iced tea, fruit punch and sports drinks started to disappear from school vending machines in 2004. A year later, new snack guidelines set calorie and fat limits, which reduced the size of snack foods like potato chips to single servings. By 2009, deep fryers were gone from cafeterias and whole milk had been replaced by one percent and skim. Broad policies like these are exactly what the Institute of Medicine recommends (me too). And now, it seems, these actions are actually having the intended effect. That’s the best news ever. And I don’t care who gets credit for it. Shouldn’t Nickelodeon adopt better nutrition standards for the products it advertises? More than 80 health groups, doctors, and nutritionists (including me) just sent a letter urging Nickelodeon and its parent company, Viacom, to adopt stricter standards for its advertisers to children. Marketing to children is the frontier of healthy eating efforts. As the Institute of Medicine reported in 2005, marketing directed at children is demonstrably effective at getting kids to want products, pester their parents for them, and believe that snacks, fast food, and sodas are “kids’ food” and what they are supposed to be eating. Efforts to get food companies to cease and desist targeting kids for ads run up against business imperatives to expand sales and report growth to Wall Street every quarter. For some years now, the kids’ TV station Nickelodeon has been struggling to find an economically viable way to restrict marketing of the worst products. But if Nickelodeon establishes commonly accepted nutrition standards for products it permits to be advertised, those standards will exclude most advertisers. “Economically viable” is what this is about. This is precisely the same dilemma caused by the ill-fated Interagency Working Group report earlier this year. I thought its proposed standards were too generous. Food companies thought they were too restrictive. The government backed off. Now Center for Science in the Public Interest (CSPI) is trying another method. It organized a letter-writing campaign to press Nickelodeon to adopt nutrition standards like those adopted by Disney a few months ago. If you think this is a good idea, you too can sign onto the campaign right here. Short of regulation, public pressure might be just what’s needed to encourage Nickelodeon—and food companies—to stop marketing junk foods to kids.